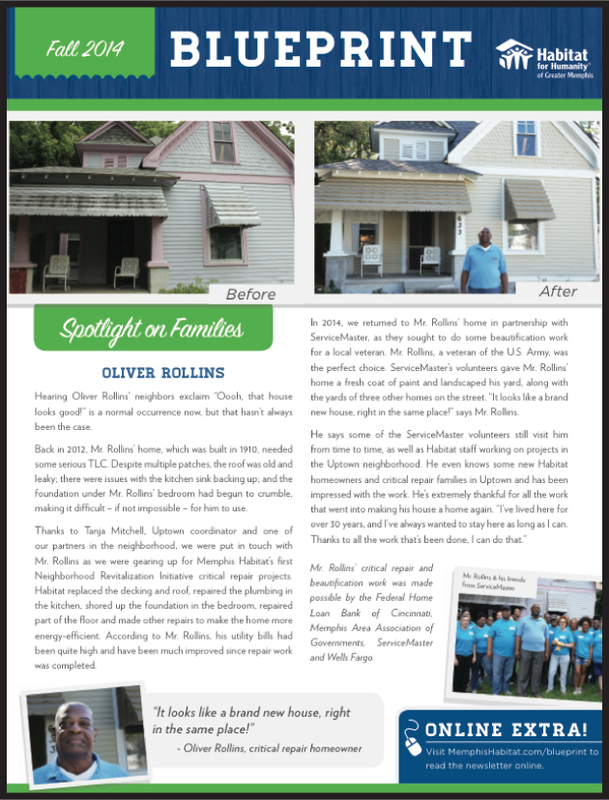 You likely recently received a mailer from us highlighting Memphis Habitat’s impact. Seeing these figures, particularly our cumulative economic impact of $100 million, was amazing to me. It’s incredible what we – what you – have done over the more than 30 years that Memphis Habitat has been serving families. But, statistics are just simple numbers without the stories behind them. Stories of families like Lillie Thompson and Oliver Rollins, two Uptown homeowners served via our Neighborhood Revitalization Initiative’s critical repair program, and Erica Norwood, who bought her first home through Habitat. Their stories are included in this issue but there are many, many others. Their stories are our stories. They are YOUR stories. Your gifts of time, talent and treasure to Memphis Habitat helped families like these turn a page and write a new story for their futures. Click HERE or on the image above to read the latest issue of Blueprint. I hope you enjoy the stories we’ve shared and encourage you to continue or renew your involvement with Habitat and create stories of your own. Please help us rewrite history for local families in need. P.S. If you did not receive the impact mailer and would like to learn more, please click HERE or reach out to me at 901-322-3505. We’d be glad to mail it to you!